Open educational resources (OERs) are defined as teaching, learning, and research resources that reside in the public domain or have been released under an intellectual property license that permits their free use and re-purposing by others. The driving force behind the shift to open educational resources remains the unabated rise in the cost of textbooks and course materials. 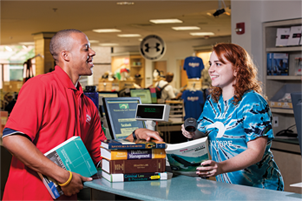 The AACC Bookstore has been actively engaged in the OER movement on campus, dating back to 2012. In recent years, the Bookstore has worked with adopting faculty from the Physics and Computer Technologies departments, assisting with adoption and distribution of OER content. In recognition of our long standing commitment to textbook affordability, the National Association of College Stores nominated the AACC Bookstore to head up a virtual advisory board, examining the impact of open educational resources on the learning process. The college has a wealth of OER related materials and resources just a mouse click away. Whether you’re ready to take the plunge or just need assistance getting started, here are some helpful hints. We recommend that your first step when seeking open course materials should be in-depth research. AACC's Truxal Library is happy to assist you with your research and has numerous resources available for your convenience. In addition to the wealth of resources provided by the Truxal Library, we have provided some select links to assist you in locating additional resources for finding and researching OERs. College Open Textbooks - a site run by the College Open Textbooks Collaborative that promotes awareness, adoption, and affordability of open textbooks. Community College Consortium for OER - AACC is a member of this consortium. Introduction to Open Education Resources (PDF) - The entire article in The College Store magazine, by Michael von Glahn (courtesy of NACS). 7 Things You Should Know About OERs (PDF) - A concise June 2010 explainer; by EDUCAUSE Learning Initiative. When a faculty member decides that they are going to use an OER, the information must be relayed to the bookstore via the formal adoption process. An OER adoption must provide a link to the resource and any other pertinent information (including, but not limited to, licensing documentation). Use of an OER does not relieve the faculty member of any duties or responsibilities under SB183 (see the Legistlation and Affordability pages for details). For an example of an actual OER adoption and the end result (what the students see in the store), please follow the link below.